The F-950 is used by QA professionals, surveyors, fresh cut produce packers, and warehouse managers to ensure superior quality. Unlike other handheld gas analyzers, the F-950 provides a complete picture of produce ripening gases, measuring carbon dioxide (CO2), oxygen (O2) and ethylene (C2H4) in real time with data-logging for later review. Interested in the F-950? Now is a great time to buy! We are offering the F-950 Three Gas Analyzer at a new, low price from now through December 31, 2015! Send us an email at sales@felixinstruments.com or submit a request for pricing and we'll contact you shortly with a quote reflecting the new price! 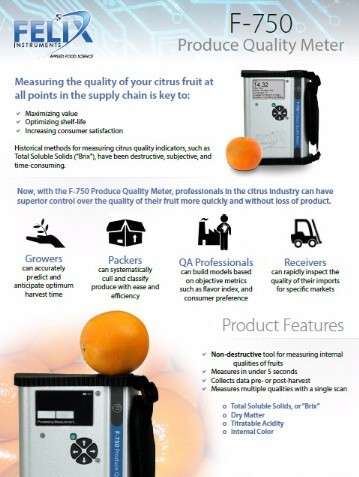 Only a few months after the launch of our F-750 Produce Quality Meter, this device is already being used for commodities ranging from berries and grapes, to apples and mangoes. Application notes on many of these commodities are now available on our website. If you're thinking about using the F-750 for a commodity that isn't currently listed on our website, please contact us. Our Application Scientists can help you determine if the F-750 is right for your commodity. Don't forget to update your Felix Instrument with the latest software or firmware available! Early last week, due to a lapse in service from our email hosting provider, we were unable to send or receive emails through our Felix Instruments email accounts. We wanted to let you know how sorry we are if you tried to contact us during this lapse and did not receive a response. The good news is that we're back online and would love to hear from you. Please don't hesitate to reach out to us if you're still waiting for an answer—we are always happy to help!